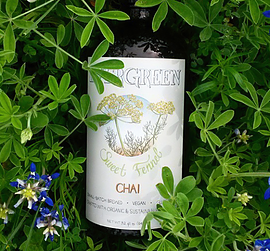 We wanted to honor chai and it's ayurvedic roots when we created the Sweet Fennel Chai recipe. The earthy notes of fennel are a traditional mainstay in Indian chai tea. Black peppercorn and fennel are known for their digestive and anti-inflammatory benefits.. Enjoy their aromatic and healing qualities in this classic tea blend. The ingredients are: purified water, evaporated cane juice, fennel, black pepper, Assam black tea, cardamom, cinnamon, and lemon juice.